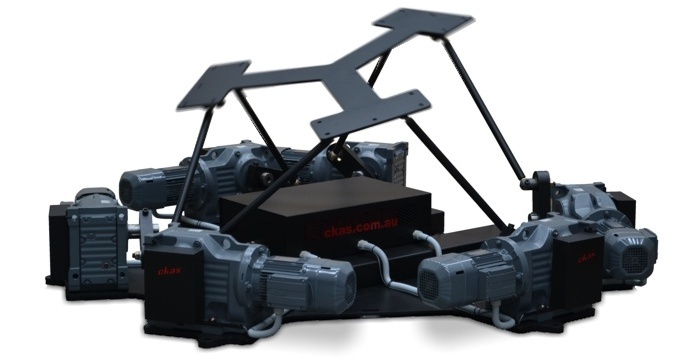 The CKAS “W” series motion platforms / systems are the flagship motion systems offered by CKAS Mechatronics and these units are all fully professional, 6DOF electric, high fidelity synergistic motion platforms / systems. These units are the “no compromise – no nonsense” solution to any motion simulator application, providing more reliability, performance and features than those available on motion system costing many times the price and now supporting payloads up to 5000kg. CKAS 6DOF Motion Platform units have been developed under the most stringent academic and professional design guidelines, to offer the highest fidelity motion systems, for the highest demand applications, at the best value. As with all our Generation III capable motion systems, the W Series units have real-time Reverse Kinematics, Forward Kinematics and Full featured Washout Cueing Filters all completely "on-board" meaning that any client application can operate these systems at even the "vehicle acceleration" level completely independent of any other software (See Gen III Connectivity Matrix document for more information). The key difference between CKAS 6DOF motion platforms / systems and other units on the market, is “design intent”. The CKAS units have been engineered specifically to be used as “Simulators” – not “rides”. This means that our washout algorithms, our controller architecture, and our mechanism design have all been refined to create the highest fidelity possible at an incredible value price point. CKAS 6DOF motion platform units are still the ONLY electric crank arm motion systems in the world which have been awarded “Full Flight Simulator” credits on the revolutionary CKAS MotionSim Series (Full Flight Trainers), and our academically developed washout cueing algorithms are the key to these awards. Of course, this doesn’t mean that the CKAS 6DOF motion platform units cannot be used in ride applications. On the contrary, these units offer the best performance / cost ratio available from any 6DOF units on the market, and the resultant customer experience is second to none. Additionally, the Film and Movie Industry can benefic greatly from GEN III CKAS motion systems, with excellent new joystick, record and playback synch features offering extensive and advanced capabilities to directors across all levels. As with all revolutionary products, CKAS are providing more performance, for lower cost, and extremely limited maintenance requirements, making the CKAS 6DOF motion platforms perfect for ANY application. If an application is to have the highest fidelity and the most realistic motion sensation, the CKAS “W” Series 6DOF motion systems are by far the best value alternatives on the market. Note: Custom units of ANY payload and specification can be designed and built to meet specific customer requirements. Please contact us for further information.